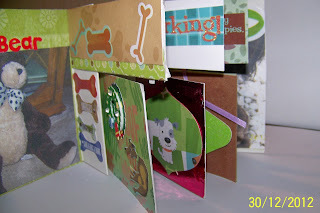 Just A Scrappin' Challenge Jan. 10 2013 Make a card, LO or project using a new technique or style that you have not done before. 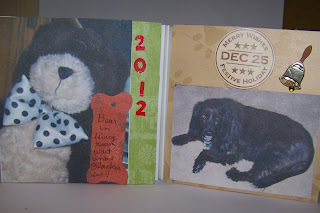 I did a flip-flop mini album for Christmas day. 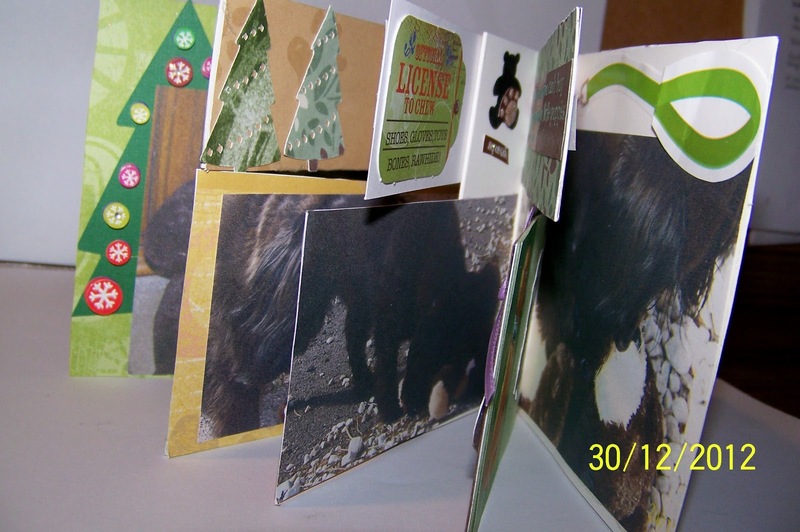 I started with 4 1/2 inch accordion fold card, used 3 small flags at the top and 3 larger flags at the bottom of the folds to make a interactive book. I used 3.5 pictures of my dog Blackie and his new Bear he got for Christmas. I used Art Philosophy to cut the embellishments <shape6>, <ormant1> at 2 inches, pages at <square1> at 4 1/2 inches. If I make another I'd make it bigger to fit the pictures better. This is the inside form the front view, you can see the picture is cut very close and see some of the embellishments on the page flags. This is the inside for the back view. the trees are also cut with Art Philosophy but I do not have the sizes. This is the front and back full pages. Join us at Just A Scrappin' this week and do something new! Nicely done Sherry! I love all the attention to details and your subject is super cute. What a great mini album about your dog-she's sure a cutie. Interesting! I'm not familiar with the flip-flop mini album. I'd like to learn more about it. 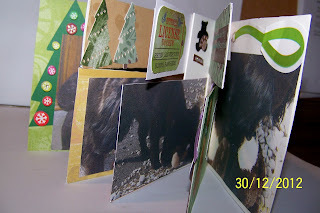 Happy 2013 just loved the idea of a flip flop album how did you get the idea for it? I never heard or seen one before??? Love your doggie what a cutie. I seen it in an old Creating Keepsakes magazine I Think. Kept the photos of it from 2006 and did it now! I just love making these flag books but haven't done so in a long time! That is the great thing about this diversified design team, we remind each other of things we have left in the past and need to be dusted off and tried again and also the great inspiration to try new things share by everyone! Love this mini book!